Beasts of No Nation is a very interesting film, and not just because the subject matter, but what the film itself represents. This is the first movie Netflix has produced as a studio, and it sets a precedent. In order for a movie to be recognized by the Academy, the film must play in Los Angeles and New York for at least seven days. 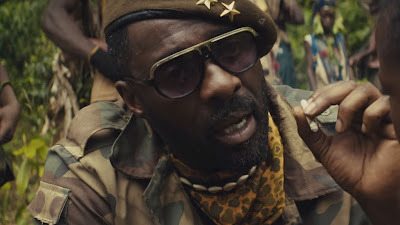 So Netflix put Beasts of No Nation in theaters for the minimum requirement in order for it to be eligible for Academy Awards, and then streamed it on their online service. This establishes a whole new way for movies to reach audiences. It also goes against the (as of yet accurate) stigma that straight-to-home-video films are bad. Beasts of No Nation is a really good movie, and though I would have preferred to experience it in a theater, watching the film in my living room was perfectly fine as well. The film focuses on Agu (played by newcomer Abraham Attah), who lives in an African nation ravaged by civil war. 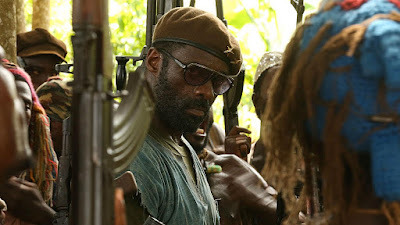 After being separated from his family, Agu is enlisted as a child soldier into a rebel group led by the Commandant (Idris Elba). Throughout his enrollment in this regime, Agu will witness horrors no one should ever have to see, complete actions unimaginable and have the lines of good and evil blurred. The performances in this film are incredible. Elba is fantastic and menacing as the Commandant. Although, he's not entirely evil. There are many points that you are watching the movie, and you can understand his point-of-view. It doesn't justify his actions, but it adds some clarity to them. He will also go a long time without doing something brutal, so you forget about just how evil of a character he is, until he does something drastic that shocks you. But even Elba is out-shined by Attah, who gives probably one of the best child actor performances I have ever seen, alongside Haley Joel Osment in The Sixth Sense. Attah, at age 14, carries this movie better than even some classically trained thespians can. He is brilliant, and I am afraid he is not getting enough credit. He breathes life into the character of Agu, and is able to bring an array of devastating and brutal emotions. I also give credit to the direction by Cary Joji Fukunaga. He clearly has given fantastic direction to Attah, in order to bring about such a powerful performance. Fukunaga also respects the sensitivity of the issue. The film never felt as if it was being negative to African nations or people, but rather giving an account of the sad reality of the situation. It isn't all doom and gloom-- Fukunaga is careful to set up the serenity of life outside the civil war in the beginning of the film. We see Agu living life with his family. His village may not have much, but he is happy nonetheless. These scenes are also pivotal to realizing the arc in Agu's character. How he goes from an innocent and care-free child to become a war-hardened soldier. This goes hand-in-hand with Fukunaga's screenplay. He also does the cinematography for this film, which I can't even begin to understand. Three of the best technical elements of this film are all done by Fukunaga, and are done masterfully. However, this is not a perfect film. The movie begins strong right out of the gate, but then loses momentum. The middle of the film began to drag, and it began to get repetitive. 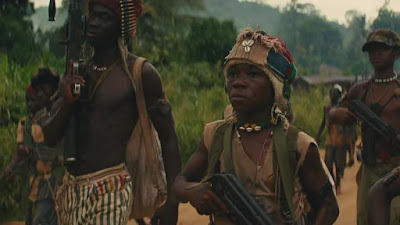 The film just showed example after example of why Elba was bad, and why this regime of child soldiers was awful, but never really built upon that. The momentum was lost until the end, when circumstances changed and the movie came to a resolution. This movie should have been shorter. If it had been tighter and drained of excess scenes, then the pace could have been kept in tact and the entire film would have felt as dynamic and startling as the beginning and end was. The other characters are also not nearly as fleshed out as Elba and Attah's characters were. The film could have also had a few more well-rounded supporting characters, which would have added more stakes to the movie. Instead, I only really felt for Agu, instead of all the child soldiers. Overall, Beasts of No Nation is an important film, not just from the Netflix angle, but in the telling of a human story about another culture many of us are not often exposed to. Cary Joji Fukunaga is brilliant with his directing, writing and cinematography. It's surprising he was able to do all three perfectly in one film. His direction is most evident with the performance from Abraham Attah, who steals the screen even from Idris Elba. Attah turns in a tragic and reserved performance, with nuances unheard of with many child actors. Elba is also fantastic in his role. Though the movie does lose its momentum half-way through, and suffers from being too long. The film could have been tightened up, and it would have made it even more powerful. But in the end, Beasts of No Nation is an important reminder of the very world outside of our own culture, and will be remembered as the film that introduced audiences to Abraham Attah. What do you think? Did you see Beasts of No Nation? Did you like it? Leave your (spoiler-free) thoughts in the comments section below.